Otto Pareroultja and his brothers Reuben and Edwin worked and painted at the Lutheran Hermannsburg Mission west of Mparntwe (Alice Springs). Initially influenced by their countryman, Albert Namatjira, and by Rex Battarbee, the Melbourne watercolourist who worked closely with the Hermannsburg artists, the Pareroultja brothers developed their own distinctive styles. In their paintings, the desert landscape is less representational than in Namatjira's work, and is animated by their use of vigorous, sinuous lines, dynamic areas of repeated patterning and strong colours massed together. 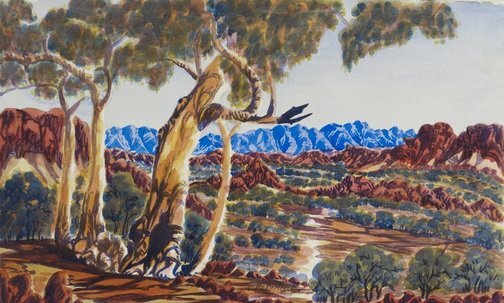 These elements are clearly evident in Pareroultja’s c1954 painting 'The hills behind Hermannsburg', which explores the common Hermannsburg school motif of a white ghost gum in front of a distant mountain range. The painting has a graphic quality, rendered in Pareroultja’s customary high-keyed colour contrasted with distinctive black line-work. His use of brilliant yellow highlights and unpainted areas of white paper add luminosity to the landscape, emphasising the clarity of central Australian light. This vibrant approach to painting has had a strong influence on Ivy Pareroultja, Edwin’s daughter, who is currently leading a revival of the Hermannsburg painting style. Signed lower c., watercolour "Otto Pareroultja". Not dated. Alison French, One sun one moon: Aboriginal art in Australia , ‘‘We’re got to follow that old man’s tracks’: Engaging with the art of Albert Namatjira’, pg. 151-163, Sydney, 2007, 159 (colour illus.). Hetti Perkins, Art + soul: a journey into the world of Aboriginal art , 'Bitter + sweet’, pg. 173-265, Carlton, 2010, 241 (colour illus. ), 282. Wayne Tunnicliff, Tradition today: Indigenous art in Australia , 'Otto Pareroultja', pg. 116, Sydney, 2004, 116, 117 (colour illus. ).